Type II (papillary serous and clear cell) endometrial carcinoma (EC) is a rare subgroup and is considered to have an unfavorable prognosis. The purpose of this retrospective analysis was to elucidate the meaning of adjuvant radiotherapy (RT) for clinical outcome and to define prognostic factors in these patients (pts). From 2004-2012 forty-two pts with type II EC underwent surgery followed by adjuvant RT at our department. Median age was 72 years. The majority were early stage carcinomas (FIGO I n = 27 [64.3%], FIGO II n = 4 [9.5%], FIGO III n = 11 [26.2%]. Seven pts (16.7%) received adjuvant chemotherapy (ChT). Pts were treated with external beam radiotherapy (EBRT) and brachytherapy (IVB) boost. Five-year local recurrence free survival (LRFS), distant metastases free survival (DMFS) and overall survival (OS) were 85.4%, 78%, and 64.5% respectively. LRFS was better with lower pT stage, without lymphangiosis (L0), without haemangiosis (V0) and negative resection margins (R0). DMFS was prolonged in lymph node negatives (N0), L0, V0 and R0. OS was improved in younger pts, N0, L0, V0 and after lymphadenectomy (LNE). Multivariate analysis revealed haemangiosis (V1) as the only independent prognostic factor for OS (p = .014) and DMFS (p = .008). 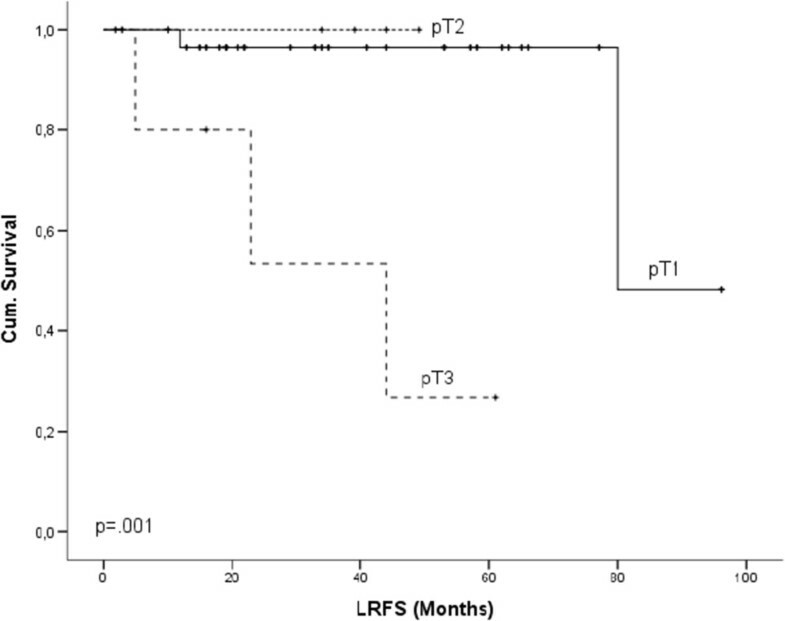 For LRFS pT stage remained as an independent prognostic factor (p = .028). Adjuvant RT with EBRT/IVB ensures adequate local control in type II EC, but control rates remain lower than in type I EC. A benefit of additional adjuvant ChT could not be demonstrated and a general omission of EBRT cannot be recommended at this point. Lymphovascular infiltration and pT stage might be the best predictive factors for a benefit from combined local and systemic treatment. Uterine carcinomas with clear cell or papillary serous histology (type II) exhibit different features than endometrioid (type I) carcinomas (EC) . They account for only 10% of all endometrial cancers, but analysis from historical data showed a substantially worse prognosis with frequent recurrences outside the uterus [2–4]. Due to their comparatively low incidence randomized trials on therapy and outcome of patients with theses histologic subtypes are scarce  and the existing retrospective studies have reported varied results regarding the effect of adjuvant radio- and chemotherapy [6, 7]. Another constraint of previously published studies is that they included heterogeneously treated patients over a time frame of more than 20 years [8–10] or that data were extracted from prospective studies which included only a small percentage of type II EC . This study was planned to investigate the prognosis and survival of women who were treated in recent years with a combined approach of local and systemic therapy. Screening our patient database we analyzed 410 women who underwent adjuvant radiotherapy (RT) for EC at the Department of Radiation Oncology at the University Hospital Heidelberg in Germany between 2004 and 2012. Among those, 42 cases presented carcinomas with clear cell, papillary serous or mixed histology and thus were included in this retrospective analysis. All patients were operated with simple hysterectomy, bilateral salpingo-oophorectomy and omental biopsy. In 15 (35.7%) women only pelvic and in 17 (40.5%) pelvic and paraaortic lymph node dissection was performed. RT consisted of external beam radiotherapy (EBRT) in 1.8-2.0 Gy fractions to a cumulative dose of 40-54 Gy (median 45 Gy) and/or HDR intravaginal brachytherapy (IVB) in 5.0 Gy fractions to a cumulative dose of 10-20 Gy (median 10 Gy). Follow-up was documented and detailed information was gathered on stage, grading, resection status, lymph and blood vessel involvement as well as on prescription of chemotherapy (ChT). For FIGO staging the 2009 classification was used and patients were reclassified if necessary . Local recurrence free survival (LRFS) was calculated as the time between first diagnosis and occurrence of first local recurrence; with local recurrence being defined as a relapse in the irradiation field. Distant metastases free survival (DMFS) was calculated from day of first diagnosis until day of distant relapse. Disease free survival (DFS) was considered to be the time from first diagnosis until local or distant recurrence. Overall survival (OS) was calculated from date of first diagnosis until death from any cause. Survival was calculated according to Kaplan and Meier and the log-rank test was used for univariate statistical evaluation. Cox proportional regression model was used for multivariate analysis. A p-value ≤ 0.05 was considered statistically significant. Statistical analysis was performed with SPSS 22.0 for Windows. Our research was carried out in compliance with the Helsinki Declaration. Table 1 summarizes patients’ characteristics. Mean age at diagnosis was 69.9 years (range: 41-89 years). Thirteen women (31%) had clear cell, 20 (47.6%) had papillary serous and 9 (21.4%) had mixed histology carcinomas. FIGO stages were distributed as follows: stage I 64.3%, stage II 9.5% and stage III 26.2%. None were stage IV. Nine women (25.7%) had positive lymph nodes. Pelvic lymph nodes were resected in 15 patients (35.7%) and in 17 (40.5%) additionally paraaortic lymph nodes were resected. In 19.5% (n = 8) the tumor had infiltrated the lymph and in 17.1% (n = 7) the blood vessels. Positive microscopic resection margins (R1) were found in 14.3% (n = 6) of patients. Seven patients (16.7%) were offered adjuvant ChT with carboplatin and paclitaxel before or after RT. Except for one patient with a stage II carcinoma all patients who received chemotherapy were diagnosed with stage III disease. Treatment is shown in Table 2. Mean follow-up was 36.8 months. Nine patients (24.1%) died during follow-up, five (11.9%) developed a local recurrence and five (11.9%) developed distant metastases. Statistical 5 year LRFS, DMFS, DFS and OS were 85.4%, 78%, 73% and 64.5% respectively (Figure 1). Distant relapses occurred in lungs (n = 3), skin (n = 1), abdominal wall (n = 1) and inguinal lymph nodes (n = 1). Kaplan-Meier survival curves for (A) LRFS, (B) DMFS, (C) DFS and (D) OS. Local control was better with lower FIGO stage (p = .031), lower pT stage (p = .001), negative resection margins (p = .037), when lymph or blood vessels were not infiltrated (p = .011; p = .015) and no ChT was applied (p = .048). Regarding DMFS higher FIGO stage (p = .028), positive lymph nodes (p = .001), positive resection margins (p = .048) as well as lymph and blood vessel infiltration (p = .001; p = .001) were negative prognostic factors. DFS was prolonged with lower pT stage (p = .009), negative lymph node status (p = .006), no lymph or blood vessel infiltration (p = .001; p = .001), negative resection margins (p = .013) and without ChT (p = .025). OS was significantly longer in younger patients (p = .028) without lymph node metastases (p = .026), when lymphadenectomy was performed (p = .004) and when neither lymph nor blood vessels were infiltrated by the tumor (p = .016; p = .023). Cox regression model revealed haemangiosis (Figure 2) as the only independent prognostic factor for OS (p = .014), DMFS (p = .008) and DFS (p = .007). For LRFS pT stage (Figure 3) was calculated to be the only independent prognostic factor (p = .028). Kaplan-Meier survival curves for haemangiosis and (A) DMFS, (B) DFS, (C) OS. Kaplan-Meier survival curves for pT stage and LRFS. In agreement with other research groups we report a majority of papillary serous carcinomas among type II EC [4, 9, 12]. In recent years efforts have been made to reduce adjuvant treatment to IVB in combination with systemic ChT. While promising results have been published in early stage carcinomas , our results do not support this trend for type II EC in general. Although almost two thirds of the patients in our analysis had stage I carcinomas, survival was generally worse than in patients with type I EC and our results regarding OS and DFS coincide with other reports [4, 5, 8–10, 14–16]. Local control was adequate with 85.4% LRFS after 5-years. This supports previous findings that adjuvant radiotherapy is capable of ensuring a good local control [10, 17]. However, it was far from control rates in women with type I carcinomas; despite that most of our patients (88.1%) underwent combined treatment with EBRT and IVB. Omission of one treatment modality cannot be recommended at this point. In our analysis only 17% of patients received adjuvant ChT and adding ChT to RT could potentially improve outcome [6, 10, 14, 18, 19]. However, the overall survival benefit from carboplatin/paclitaxel ChT was poor in our analysis and the efficiency of the established taxol/platinum based ChT regimens in type II EC may be questioned. Regardless of the selection bias of treating predominantly stage III patients with adjuvant radiochemotherapy (RChT), which resulted in a significantly worsened outcome after ChT, there was no statistically significant survival difference between the sole RT and the RChT groups. Although numbers are small, this points toward the necessity of new agents and further investigation of molecular targeted therapies such as inhibitors of vascular endothelial growth factor (VEGF) and mammalian target of rapamycin (mTOR) or tyrosin kinase inhibitors (TKI) . Regarding primary surgical therapy, we found that the conduction of lymphadenectomy was associated with prolonged overall survival in our study, stressing the importance of comprehensive surgical staging [21, 22]. Performance of selective surgical staging, as it is standard for endometrioid uterine carcinoma, cannot be recommended [23, 24]. In our analysis lymphangiosis and haemangiosis were prognostic factors of LRFS, DMFS, DFS and OS in univariate analysis and blood vessel infiltration remained the only independent prognostic factor in multivariate analysis of DMFS, DFS and OS. Lymphovascular invasion has previously been associated with prolonged survival [10, 12, 25–27]. 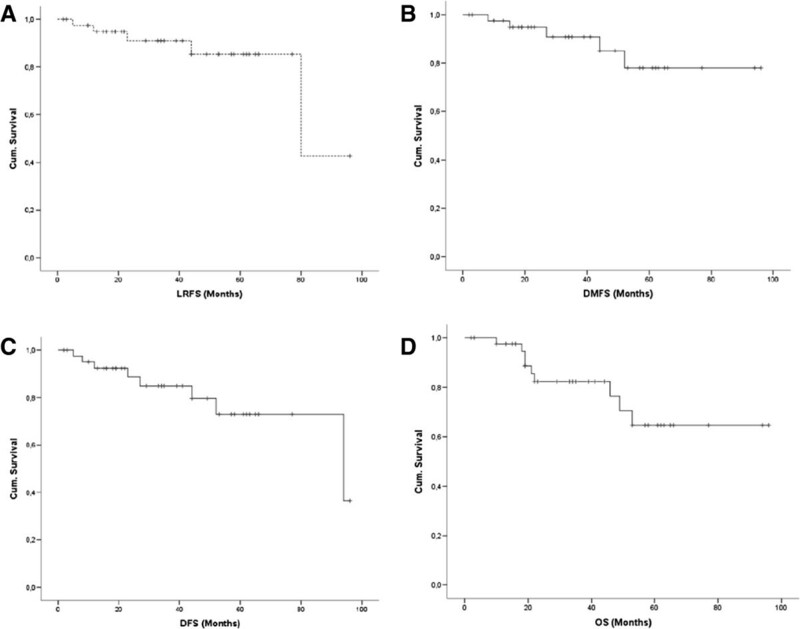 Additionally we found pT stage to be the only independent prognostic factor of prolonged LRFS. Lymphovascular invasion and extend of local tumor spread may therefore be the best predictors of a benefit from combined local and systemic treatment. Future efforts should be directed towards multi-institutional randomized trials to enable a better understanding of this highly malignant disease’s therapy requirements. Adjuvant RT with EBRT/IVB ensures adequate local control in type II EC, but control rates remain lower than in type I EC. A benefit of additional adjuvant ChT could not be demonstrated and omission of EBRT, as conducted in early stage type I carcinoma, cannot be recommended at this point. Lymphovascular invasion pT stage might be the best predictive factors for a benefit from combined local and systemic treatment. RF and KL developed and planned this retrospective study. RK and RF were responsible for data collection and statistical analysis. All authors read and approved the final manuscript.